Today in our head-to-head review article, we will be taking a look at the Lodge L8DD3 vs Bruntmor Double Dutch Ovens. These top-selling products will add value and convenience to any kitchen. Furthermore, both double Dutch ovens are priced competitively and won’t break the bank. However, while both of these products are a favorite among customers, there can only be one winner. And in this article, we will be comparing each product’s key features, pros, cons, and other important factors. These factors will include; ease-of-use, durability, versatility, ease-of cleanup, and maintenance. But first, if you are wondering what a double Dutch oven is, then click here for our in-depth explanation. However, if you are short on time, simply continue reading down below for a quick rundown. What Exactly Is A Double Dutch Oven? A double Dutch oven, in simple terms, is a Dutch oven that has a lid that “doubles” as another cooking tool. These lids usually turn into a skillet or griddle. And they are incredibly versatile and handy. Likewise, you’ll be able to cook two different meals at the same time. For example, cook a stew for lunch in the main Dutch oven pot. And while that’s cooking, fry eggs and bacon for breakfast in the skillet lid. As you can see, owning a double Dutch oven can be very rewarding and a real asset in the kitchen or campsite. And if you would like more information on Double Dutch Ovens, then click here and read our in-depth article. With that said, let’s start with some key feature of the Lodge L8DD3 double Dutch oven as well as some pros and cons. The Lodge L8DD3 double Dutch oven offers a plethora of handy features. Among the best is the fact that the lid doubles as a skillet. This makes both indoor and outdoor cooking a breeze. And whether it’s a hiking trip with friends or a camping trip with the family, the Lodge L8DD3 double Dutch oven is sure to impress all who experience it. 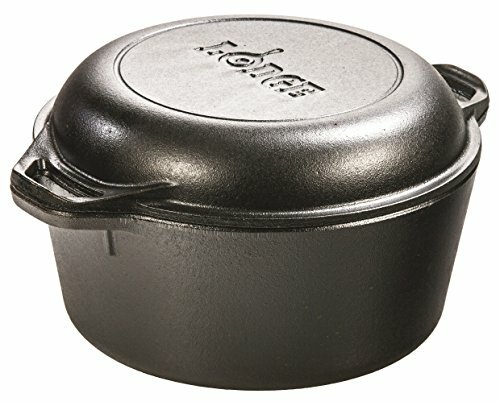 If you’ve already made up your mind and are interested in the Lodge L8DD3 double Dutch oven, then you can click here straight to Amazon.com for current pricing and more information. With that said, be sure to check out the Lodge L8DD3 double Dutch oven today at Amazon.com. Now let’s move on to the Bruntmor double Dutch oven, shall we? The Bruntmor double Dutch oven offers a great number of handy features. You’ll be able to roast, fry, saute, bake, and much more. Furthermore, the high-domed lid will self-baste and easily hold a large roast or whole chicken. Whats more is the fact that this double Dutch oven can be used both indoors and outdoors. And whether are camping or preparing a Holiday feast, this product can handle anything you can throw at it. Now let’s compare both of these double Dutch ovens against one another, shall we? 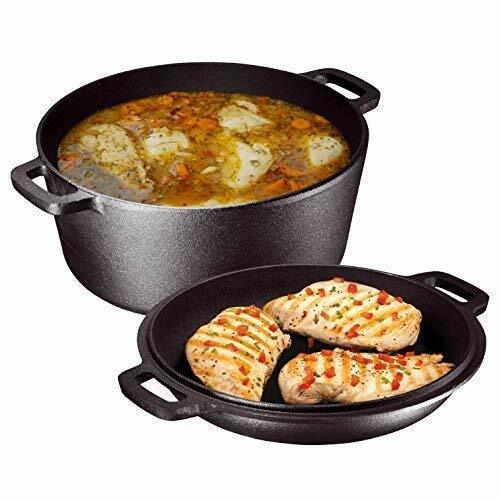 If you feel that the Bruntmor double Dutch oven would be a great fit for you, visit Amazon.com today for a great product at an amazing price. Which Double Dutch Oven Is More Durable? One of the most important factors when considering new cookware is build quality. This factor alone can make or break any Dutch oven purchase. And both of these Dutch ovens are definitely up to the task. However, there can only be one winner. So, which double Dutch oven came out on top? While both Dutch ovens offer up a durable solid cast build, we ultimately had to look at some other customer ratings and issues. This showed us that the Bruntmor Double Dutch oven had more negative experiences with build quality. And while these issues are rare, they still need to be addressed. The Lodge L8DD3 double Dutch oven simply had fewer reports of cracking, wear damage over time, and damage from the factory. And while you can’t go wrong with either model, if we had to choose a double Dutch oven based on durability, the Lodge L8DD3 model would win out. Which Double Dutch Oven Is More Versatile? This is a litter harder. Both of these double Dutch ovens offer up a great cooking experience. You’ll be able to prepare chicken, roast, steak, fish, and even bake desserts on both models. However, there is a key difference. The Lodge L8DD3 double Dutch oven has maximum oven temperature of 500 degrees Fahrenheit. This is in contrast to the Bruntmore model that has a maximum cooking temperature of only 450 degrees. And while this isn’t a huge difference it may be enough to for the Lodge L8DD3 double Dutch oven to edge out the Bruntmor model. So, what’s our verdict? While the Bruntmor double Dutch oven offers most of the same great features as the Lodge model, we just had to consider the slight temperature advantage Lodge has. Both offer oven and induction cooking. And both also offer lids that double as handy skillets. So in the end, it all came down to maximum oven temperature. Which Double Dutch Oven Is Easier To Clean And Maintain? Cleaning and maintenance is yet another important factor when considering your next Dutch oven purchase. And both of these double Dutch oven models make for an easy clean-up. Furthermore, all you’ll need to do is scrape any leftover food from your Dutch oven. Next, use a nylon scrubber and hot water to clean your pan. If you need to use dish soap, make sure to re-season the Dutch even as dish soap may strip the seasoning that is already in place. And, you’ll want to make sure to thoroughly hand-dry your cookware so it does not rust. So which Dutch oven does it best? Tie…..They’re both easy to clean and maintain. Well, we have our first tie. As you can see, both the Lodge and Bruntmor double Dutch oven models are very easy to clean and maintain. Likewise, these Dutch ovens are much more durable and will last longer than other material types. So whichever one you pick, both of these double Dutch ovens are on level playing fields. And both will offer simple and convenient cleaning and maintenance. With that said, let’s move on to our last factor when deciding which Dutch oven to choose. But before that, however, if you would like more information on cleaning and maintaining cast iron cookware, then please Click Here. And if you like the Lodge double Dutch oven then Click Here to visit Amazon.com. If you fancy the Bruntmor double Dutch oven more, then please Click Here. Which Double Dutch Oven Is More Affordable? Our final factor to consider is affordability. And both of these heavy hitters wouldn’t be the top-sellers they are if they were incredibly overpriced. So, which double Dutch oven is the most affordable? Both of these products currently come in at under $60 each. So, they won’t break the bank and are perfect for Birthday and Christmas gifts. Furthermore, they will make a great addition to any kitchen and are perfect for indoor and outdoor use. What Do These Double Dutch Ovens Have In Common? For most of this article, we have been discussing the differences between these two double Dutch ovens. However, there are some key factors that they both share. So, without further ado, let’s get into it. One of the great shared features of these double Dutch ovens is the material used to build them. For centuries, cast iron has been the go-to material when creating cookware and tools designed to last. Furthermore, cast iron possesses unique heat-retention capabilities that are superior to most other material types. And the nutritional iron that you can receive from this material is also beneficial. Finally, cast iron cookware can generally be used outdoors as well. Like on grills and in firepits for example. By now it should be obvious where the term “double” comes from in the name double Dutch oven. And both of these double Dutch ovens offer up handy dual-purpose skillet lids. You can easily cook breakfast in the skillet lid while you prepare lunch or dinner in the Dutch oven. Either way, both of these products offer added value and convenience that few pieces of cookware even come close to offering. Finally, both of the lids to these Dutch ovens feature a deeper dome shape to allow for larger cuts of meat and effortless basting. One of the greatest features of cast iron cookware is its ability to be used outdoors. And both Lodge and Bruntmor have you covered in that area for sure. Furthermore, you’ll be able to prepare your meals over an outdoor grill with ease. And if you’re feeling adventurous, place your double Dutch oven over a fire pit while camping or hiking. One of these double Dutch ovens will be your go-to indoor and outdoor cookware for years to come. With that said, there can only be one winner, so let’s take a look at out overall top choice. While both of these double Dutch ovens are in leagues of their own, at the end of the day there can only be one winner. And just so it’s clear, you really can’t go wrong choosing either of these double Dutch ovens. With that said, which one do we feel is the better Dutch oven? One of the biggest reasons that the Lodge L8DD3 double Dutch oven beat out the Bruntmor model is the differences in maximum oven temperatures. And with only a 50-degree difference, the Lodge Dutch oven comes out on top. With a max temperature threshold of 500 degrees vs 450 degrees Fahrenheit. And while that isn’t much of a difference, these two double Dutch ovens were just too similar in quality and features to not nitpick. The prices were about the same, they both had skillet lids, and they are both constructed of cast-iron. So while you won’t go wrong with either product, if we really had to choose between the two, we would pick the Lodge L8DD3 Double Dutch oven. It offers everything Bruntmor offers but with a higher temperature threshold. Which to us means that Lodge decided to go that extra step for their customers. Well, there you have it, our comparison article on Lodge L8DD3 vs Bruntmor Double Dutch Ovens. We hope you enjoyed it and gained some knowledge along the way. And we also hope this article made it easier to choose your next double Dutch oven. With that said you can find a more in-depth review of the Lodge L8DD3 double Dutch oven by Clicking Here. And the Bruntmore double Dutch oven review article can be found by Clicking Here. Thank you very much for viewing our article on Lodge L8DD3 vs Bruntmor Double Dutch Ovens. We hope to see you in the near future very soon. And as always, have a great day and please take care.